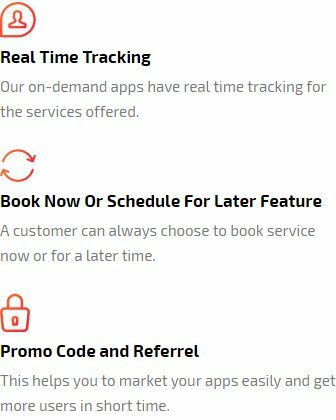 Zip past every business and reach the pinnacle of success with the new On Demand Moto application! A cost effective and smart solution for all your customers is here now! An app is only as good as the User likes it. This fantastic app was built to ensure that you can offer cheap rides to your customers while giving anyone with a bike an opportunity to make money by helping people get places. The app has been designed bearing in mind that it is for the masses. So, whether your Rider has an Android or an iOS he or she will be able to book rides easily. Even Drivers with both Android and iOS can offer and accept rides easily. Your app has to be accessible by EVERYONE! Its 100% responsive design and beautiful interface ensures that it works flawlessly over handsets, tablets PCs, laptops or any other digital assistant! Travel is quite important in today's time and everyone wants the cheapest possible option. Here's where your app is going to play an important role. 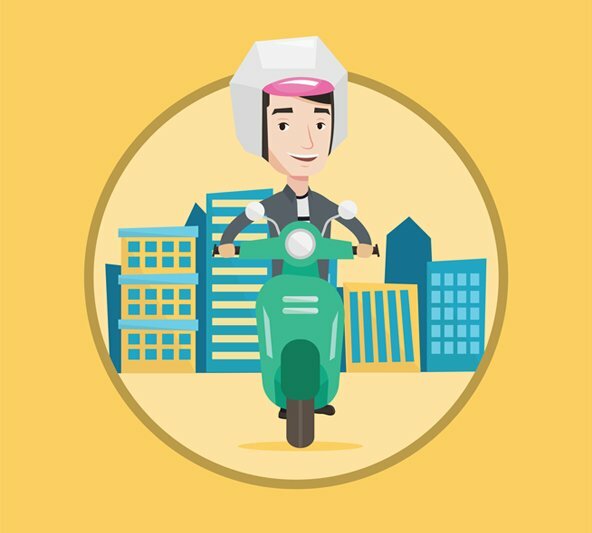 This is an on demand MOTO app that makes bikes and scooters available as a taxi! It is a unique concept and can be the reason for the increase in a whole lot of money for everyone involved! In order to use this app to book a ride on a bike, the user has to first download this app and register into it. The registration process is a breeze. People can log in using their already existing social media ID's like Facebook or Twitter or they can choose to create a new account by filling in all their necessary information like name, email id, phone number etc. Phone verification will happen after the user registers. This will happen by sending an OTP to the user which can be fed into the app and thereby completing the registration. This is an especially important step to verify the authenticity of the Driver as well as the Rider. Once the registration is done, the Rider can book a ride whenever he or she wishes to. The Driver too can start offering rides easily after registering into the app. To book the Ride, the Rider has to enter the Pickup address and the Drop location address. The Rider is shown the estimated fare of the ride. Once the Rider confirms the request, the app automatically sends out a request to all the Moto Drivers around their area. Whenever the Moto Driver receives the request, he will get the request along with a timer. The Driver has to accept the request within the stipulated time to ensure that he can get the booking. Once the Driver accepts the request, he gets the job. When this happens, the app automatically sends a confirmation to the Rider along with the details of the Driver as well as the license plate number of the bike. The Driver too receives a job confirmation along with the Rider's details as well as the address of the Pickup location. The Driver reaches the pickup location, takes the Rider and drops him or her at the drop location. When the ride is over, the Driver marks it as trip completed. A bill is generated showing the trip details and the amount on the Driver's as well as Rider's app. The Rider has an option of paying by Cash, Card or In App Wallet. When the ride terminates, the payment gets deducted automatically from the Rider's app wallet or the Card chosen. In case the payment mode selected is cash, the Rider will directly pay the Driver. Now, the Rider and the Driver will both be able to rate each other. This is a revolutionary approach to making the most of the Ride booking scenario in the world. By empowering everyone to offer rides and make money, this application is sure to be the next big thing in the world of transportation. This Is The Future. This App Is All Set To Establish Your Name In The Market. We have loaded this app with the most amazing features and that too at the most competitive price in the market! Go for it NOW! It's a business after all and we don't want to give you something incomplete. 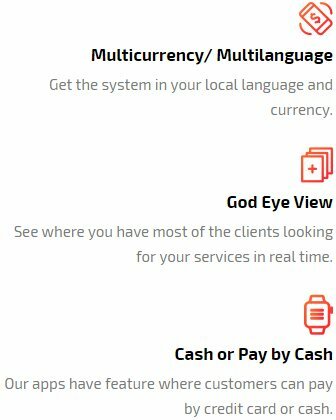 An app based business has many faces. We therefore offer you a holistic solution that will take care of all your worries in a jiffy! Just like a bike, our Moto app has 2 wheels: the Rider application and the Driver application. 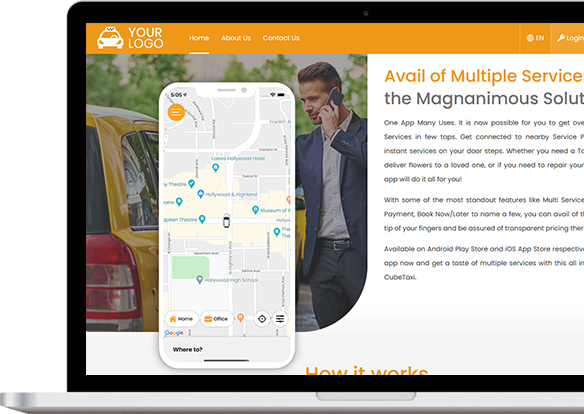 The Driver application is used by the Driver to offer and Accept rides, whereas the Rider application is used by the Rider to book his or her rides. But apart from the two wheels a bike needs a handle. That handle is the Admin panel. The admin panel of our application helps you to control and literally "handle" the app from everywhere. The admin panel will allow you to monitor the number of vehicles you have in the field, how much money you are making, where are the maximum rides being booked from, etc. When you have the drive to achieve something and a market dominant app similar to Go-Jek to back it, you will surely be a force in the transportation world to be reckoned with. Make the most of this opportunity. Invest NOW! Take a FREE DEMO of the app here!